The metabolic flux of a given enzymatic pathway can be regulated by photoswitching thus resulting in an improved understanding of the biological functions of a given enzyme in vivo or in a controlled yield of intermediate substrates (Bose et al., 2006). As proof-of-concept, we incorporated the non-canonical amino acid phenylalanine-4’-azobenzene (AzoF) into one enzyme coded by the gene crtI of the β-carotene pathway (BBa_K2201207) (Schaub et al., 2012). If the photoswitch is in the OFF state, the orange colored lycopene is not synthetized. After irradiation the photoswitch is turned ON, which leads to the synthesis of lycopene and its detection. Investigations of biological functions of proteins and enzymes in vivo are limited based on the inability to specifically control their functions. The usage of photolabile protection groups allows for temporal and spatial control of chemical and biological processes (Bose et al., 2006; Wang et al., 2009; Klán et al., 2013). Two photolabile approaches can be chosen: (i) photocaging and (ii) photoswitching (Brieke et al., 2012). Photocaging: A “protection” group facilitates or inhibits the normal function of a given protein, but after cleaving of the chemical moiety the protein of interest is de/activated. This process is irreversible. Photoswitching: The used chemical moiety used can be switched between “ON" and "OFF” stages. This process is reversible. For both approaches the incorporation of a chemical moiety into a permissive site of the protein of interest is accomplished through amber suppressor tRNA (Bose et al., 2006). The advantage of light as the trigger for the cleaving and conformational change lies in its highly controllable, selective and inexpensive application. In contrast to chemical substrates used for induction of a reaction, light does not leave residues which themselves can influence the test environment. Furthermore, many already established techniques can be adapted to apply the specific wavelength and irradiation time for any possible non-canonical amino acid (Brieke et al., 2012). Phenylalanine-4’-azobenzene is an amino acid-derivate with a photoisomerizable azobenzene moiety. Upon irradiation with a wavelength between 320 – 340 nm it switches from its more stable trans into its cis isomer due to the rotation around the N-N bond (Figure 1). The cis to trans isomerization can be thermally induced or occurs after irradiation with a wavelength > 420 nm (Figure 1) (Zimmerman et al., 1958; Bose et al., 2006; Brieke et al., 2012). Figure 1: Structure of AzoF in cis- and trans-conformation. Lycopene and β-carotene, both members of the carotenoid family, originate from the terpenoid biosynthetic pathway and are ubiquitous pigments found in bacteria, archaea, fungi and plants (Lee and Schmidt-Dannert, 2002). Their biological functions range from light absorption, thus playing a role in energy uptake and transduction, preventing photo-damage, antioxidant properties, and being precursors for multiple hormones, such as Vitamin A (Palozza and Krinsky, 1992; Vershinin, 1999; Lee and Schmidt-Dannert, 2002). Furthermore, carotenoids are used as colorants in food and cosmetics, but also as food additives, in pharmaceuticals and neutraceuticals (Lee and Schmidt-Dannert, 2002; Yuan et al., 2006). Due to their antioxidant properties, many studies investigate carotenoids in regards to cancer and degenerative diseases (Palozza and Krinsky, 1992; Mayne, 1996; Kirsh et al., 2006; Wang et al., 2009). Thus an upscale in production of carotenoids using microbial fermentation systems with recombinant carotenoid genes in non-carotenogenic microbes like E. coli has increased (Yuan et al., 2006; Yoon et al., 2009; Albermann et al., 2010). The universal precursors of the carotenoid biosynthesis pathway are the isomers isopentenyl pyrophosphate (IPP) and dimethylalkyl pyrophosphate (DMPP) (Rodríguez-Villalón et al., 2008). 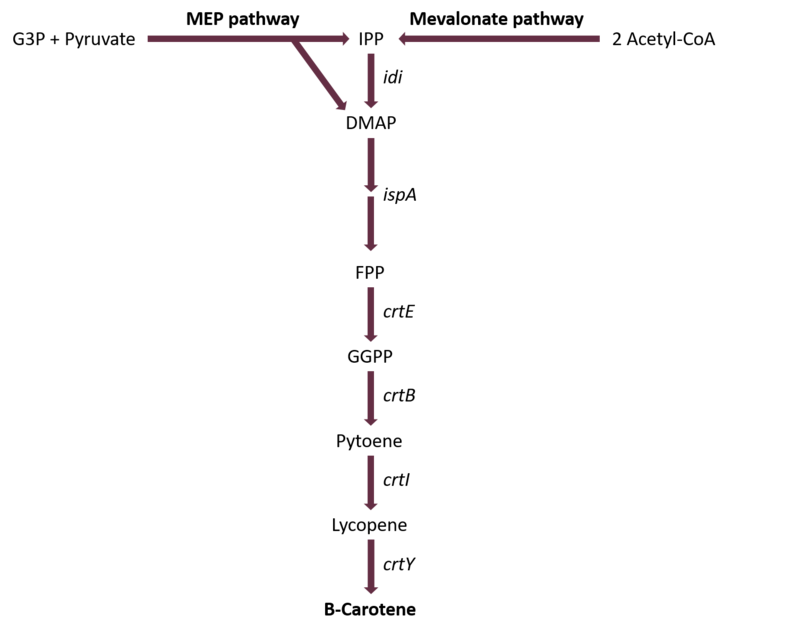 In nature, two independent pathways lead to the precursor biosynthesis: (i) The mevalonic acid (MVA) pathway, found in eukaryotes, archaea and some bacteria with the primary educt acetyl-CoA (Kirby and Keasling, 2009). (ii) The alternative metabolic methylery thriol phosphate (MEP) pathway, found in most bacteria and plant plastids with the primary educts being pyruvate and glycerylaldehyde-3-phosphate (GAP), which condensate (Rohmer, 1999; Lange et al., 2000; Rohdich et al., 2003). IPP and DMPP are then catalyzed to farnesyl pyrophosphate (FPP) by two sequential prenyltransferase reactions by farnesyl diphosphate synthase encoded by ispA (Yuan et al., 2006). FPP is the common branch point for carotenoid, but also other isoprenoid biosyntheses like dolichols and quinons. Also FPP naturally occurs in the non-carotenogenic E. coli. For production of lycopene and β-carotene just four genes from the bacteria Pantoea ananas need to be heterologously expressed in E. coli (Choi et al., 2013; Yuan et al., 2006): (i) crtE coding for geranylgeranyl diphosphate synthase which catalyzes the condensation of FPP and IPP to form geranylgeranyl diphosphate (GGPP) (Misawa et al., 1990), (ii) crtB coding for the phytoene synthase which catalyzes the condensation of two GGPP to yield phytoene (Iwata-Reuyl et al., 2003), (iii) crtI coding for phytoene desaturase which forms lycopene (Fraser et al., 1992), and (iv) crtY coding for lycopene cyclase which catalyzes the cyclization of lycopene and thus converting it to β-carotene. Just the two last products of the β-carotene biosynthesis are colored compounds with lycopene being red and β-carotene being orange due to their polyene chromophore (Schaub et al., 2012). Figure 2: Biosynthesis Pathway of β-Carotene. Two independent pathways feed the biosynthesis of β-carotene with the precursors IPP and DMAP. Based on Yoon et al., 2009. As a proof-of-concept for our photoswitch application, we incorporated the non-canonical amino acid AzoF into the binding site of crtI by an aaRS (BBa_K2201207), which catalyzes the production of lycopene. crtI is part of the flavoprotein superfamily comprising protoporphyrinogen IX oxidoreductase and monoamine oxidase (Schaub et al., 2012). By incorporation of AzoF the metabolic flux through this specific pathway can be controlled. In the OFF state, in which AzoF is in cis-form, the colorless substrate 15-cis-phytoene cannot bind and cannot be catalyzed to the red colored all-trans-lycopene. After irradiation AzoF isomerizes into its trans-form, which defines the ON state. The substrate can bind and can be catalyzed into lycopene which can easily be detected through its color. Albermann, C., Trachtmann, N., and Sprenger, G.A. (2010). A simple and reliable method to conduct and monitor expression cassette integration into the Escherichia coli chromosome. Biotechnol. J. 5: 32–38. Bose, M., Groff, D., Xie, J., Brustad, E., and Schultz, P.G. (2006). The Incorporation of a Photoisomerizable Amino Acid into Proteins in E. coli. J. Am. Chem. Soc. 128: 388–389. Brieke, C., Rohrbach, F., Gottschalk, A., Mayer, G., and Heckel, A. (2012). Light-Controlled Tools. Angew. Chem. Int. Ed. 51: 8446–8476. Choi, S.-K., Osawa, A., Maoka, T., Hattan, J.-I., Ito, K., Uchiyama, A., Suzuki, M., Shindo, K., and Misawa, N. (2013). 3-β-Glucosyl-3’-β-quinovosyl zeaxanthin, a novel carotenoid glycoside synthesized by Escherichia coli cells expressing the Pantoea ananatis carotenoid biosynthesis gene cluster. Appl. Microbiol. Biotechnol. 97: 8479–8486. Fraser, P.D., Misawa, N., Linden, H., Yamano, S., Kobayashi, K., and Sandmann, G. (1992). Expression in Escherichia coli, purification, and reactivation of the recombinant Erwinia uredovora phytoene desaturase. J. Biol. Chem. 267: 19891–19895. Iwata-Reuyl, D., Math, S.K., Desai, S.B., and Poulter, C.D. (2003). Bacterial Phytoene Synthase: Molecular Cloning, Expression, and Characterization of Erwinia herbicola Phytoene Synthase. Biochemistry (Mosc.) 42: 3359–3365. Kirby, J. and Keasling, J.D. (2009). Biosynthesis of Plant Isoprenoids: Perspectives for Microbial Engineering. Annu. Rev. Plant Biol. 60: 335–355. Kirsh, V.A., Mayne, S.T., Peters, U., Chatterjee, N., Leitzmann, M.F., Dixon, L.B., Urban, D.A., Crawford, E.D., and Hayes, R.B. (2006). A Prospective Study of Lycopene and Tomato Product Intake and Risk of Prostate Cancer. Cancer Epidemiol. Prev. Biomark. 15: 92–98. Klán, P., Šolomek, T., Bochet, C.G., Blanc, A., Givens, R., Rubina, M., Popik, V., Kostikov, A., and Wirz, J. (2013). Photoremovable Protecting Groups in Chemistry and Biology: Reaction Mechanisms and Efficacy. Chem. Rev. 113: 119–191. Lange, B.M., Rujan, T., Martin, W., and Croteau, R. (2000). Isoprenoid biosynthesis: The evolution of two ancient and distinct pathways across genomes. Proc. Natl. Acad. Sci. U. S. A. 97: 13172–13177. Lee, P. and Schmidt-Dannert, C. (2002). Metabolic engineering towards biotechnological production of carotenoids in microorganisms. Appl. Microbiol. Biotechnol. 60: 1–11. Mayne, S.T. (1996). Beta-carotene, carotenoids, and disease prevention in humans. FASEB J. Off. Publ. Fed. Am. Soc. Exp. Biol. 10: 690–701. Misawa, N., Nakagawa, M., Kobayashi, K., Yamano, S., Izawa, Y., Nakamura, K., and Harashima, K. (1990). Elucidation of the Erwinia uredovora carotenoid biosynthetic pathway by functional analysis of gene products expressed in Escherichia coli. J. Bacteriol. 172: 6704–6712. Palozza, P. and Krinsky, N.I. (1992). Antioxidant effects of carotenoids in Vivo and in Vitro: An overview. Methods Enzymol. 213: 403–420. Rodríguez-Villalón, A., Pérez-Gil, J., and Rodríguez-Concepción, M. (2008). Carotenoid accumulation in bacteria with enhanced supply of isoprenoid precursors by upregulation of exogenous or endogenous pathways. J. Biotechnol. 135: 78–84. Rohdich, F., Zepeck, F., Adam, P., Hecht, S., Kaiser, J., Laupitz, R., Gräwert, T., Amslinger, S., Eisenreich, W., Bacher, A., and Arigoni, D. (2003). The deoxyxylulose phosphate pathway of isoprenoid biosynthesis: Studies on the mechanisms of the reactions catalyzed by IspG and IspH protein. Proc. Natl. Acad. Sci. U. S. A. 100: 1586–1591. Rohmer, M. (1999). The discovery of a mevalonate-independent pathway for isoprenoid biosynthesis in bacteria, algae and higher plants. Nat. Prod. Rep. 16: 565–574. Schaub, P., Yu, Q., Gemmecker, S., Poussin-Courmontagne, P., Mailliot, J., McEwen, A.G., Ghisla, S., Al-Babili, S., Cavarelli, J., and Beyer, P. (2012). On the Structure and Function of the Phytoene Desaturase CRTI from Pantoea ananatis, a Membrane-Peripheral and FAD-Dependent Oxidase/Isomerase. PLoS ONE 7: e39550. Vershinin, A. (1999). Biological functions of carotenoids - diversity and evolution. BioFactors 10: 99–104. Wang, Q., Parrish, A.R., and Wang, L. (2009). Expanding the Genetic Code for Biological Studies. Chem. Biol. 16: 323–336. Yoon, S.-H., Lee, S.-H., Das, A., Ryu, H.-K., Jang, H.-J., Kim, J.-Y., Oh, D.-K., Keasling, J.D., and Kim, S.-W. (2009). Combinatorial expression of bacterial whole mevalonate pathway for the production of β-carotene in E. coli. J. Biotechnol. 140: 218–226. Yuan, L.Z., Rouvière, P.E., LaRossa, R.A., and Suh, W. (2006). Chromosomal promoter replacement of the isoprenoid pathway for enhancing carotenoid production in E. coli. Metab. Eng. 8: 79–90. Zimmerman, G., Chow, L.-Y., and Paik, U.-J. (1958). The Photochemical Isomerization of Azobenzene1. J. Am. Chem. Soc. 80: 3528–3531.